We have just sent out an email to all of our customers which prompts you to confirm your email address. As we are currently updating our records, we wish to ensure that the contact information in our files is accurate and up to date. Please look for the confirmation email in your Doteasy account email inbox, click the button to confirm your email address, and follow the instructions to finish the confirmation. The confirmation should take less than a minute or so. Yes, this email verification is legit and from Doteasy. 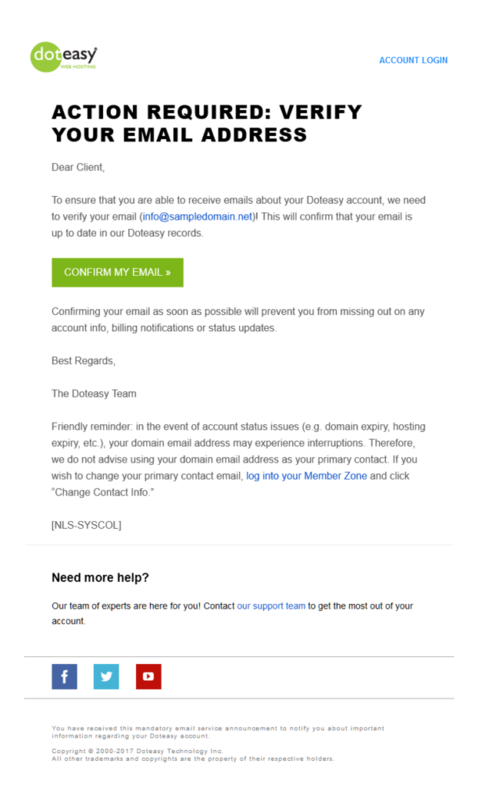 Note that for tracking purposes, Doteasy has employed a third-party email provider to send out the verification emails. Why do I see a link that is not from Doteasy? Doteasy employs a third party email delivery platform to send out system email messages to clients. In order for us to accurately track and record the verification process, the third party email system automatically adds a tracking code to the link on the email message. Because of this, you may see that the button link will redirect you to a non-Doteasy page. Please note that the link is safe to click, and you will be redirected to the Doteasy page for continuation of the verification process. I’ve already been receiving emails from Doteasy in the past. Why do I still need to verify? We first would like to apologize for any inconvenience the verification email message may have caused. Customer satisfaction is always our first priority! In order to ensure that our customers’ email addresses are up-to-date, we need all of our customers to verify their email addresses. By confirming your email address, we can be sure that you are able to receive the emails as intended. Customers can then rest assured that they will receive important account updates from Doteasy, without any issues in the future. A friendly reminder: we do not advise you to use your domain email address as your primary contact, as your domain email address may experience interruptions in the event of account status issues (e.g. domain expiry, hosting expiry etc.). We hope that all of these preventive measures can minimize any service interruptions as much as possible. Thank you so much for your part in helping us update our records!